This is Young's second book. 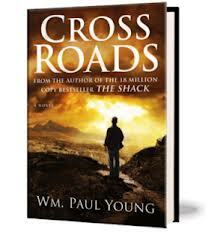 First was "The Shack" Cross Road is very similar to The Shack, very spiritual, religious oriented. Books like these need to be read very slowly, patiently and carefully, cuz there is always a message n lessons in such fiction books which relates to our every day to day life. However, let's talk about Anthony Spencer, the main character of this story !! The problem with him was that he was a very selfish, paranoid, egoistic, ambitious, sociopathic, self-made businessman, who never valued his family, never valued love, who cut himself off from the people who loved him, his ex-wife, his daughter and his son who died at a very young age. A brain tumor and cerebral hemorrhage leaves his body in coma and landed him in ICU. Here he interacts and encounters with the Holy spirits, who reveals the state of his heart to him, and gives him an opportunity to be transformed. Transforming his life from being egoistic to helping others, love others. This is what we take at the end of the day with us. Tony is now visiting in minds of those surrounding him. And what happens when Jesus himself tells Tony that he could heal one person? Will this selfish man win or he will experience a change in his heart? There is this beautiful lines at the end of the book which sums up the book. If u are one in those million people who picked "The Shack", then u shouldn't give a second thought on this one. I got this copy from Chapters, Indigo. Actually i ordered it from library, but I was way way behind for my turn and I couldn't wait. I thought of keeping it in my shelf, but after reading it, I decided to donate it to the library, cuz I don't want others to wait to read this. Of course a MUST read !! I loved the "Shack", this looks interesting, guess Ill be putting it on my to read list. Great review, thanks for sharing! Thanks for stopping by. U are followed.